As a child growing up in San Francisco, Peter Bratt spent countless hours watching the artfully decorated cars cruise past 24th and Mission Street. Now an independent filmmaker and screenwriter, Bratt spent his childhood in the Mission, building his roots in a community where social justice, storytelling, and art were seen as central aspects of life. When it came time to make a film about the community that inspired him, then, Bratt knew exactly where to look. “At that age, it was the most exciting thing I’d ever seen. The lowrider girls and guys, who got dressed a certain way and lived by a code, they were like superheroes to me,” Bratt said. It was this inspiration that led Bratt to write and direct La Mission, a 2009 film chronicling a Latino father and son struggling to overcome the secrets that lay between them. Starring Bratt’s brother, Benjamin, La Mission portrays the ways that race, class, sexuality, family, and lowrider culture overlap in the neighborhood of Bratt’s childhood. At a screening of the film hosted on Sept. 20 at Bloomington’s Buskirk-Chumley Theatre, Bratt drew upon these distinct threads to explain why art, storytelling, and identity are so critical to contemporary American life. “[Bratt’s film] looks at this idea of identity as a whole, but also looks at the individual that falls within these different identities,” said Lillian Casillas-Origel, director of La Casa, which helped make Bratt’s talk possible. 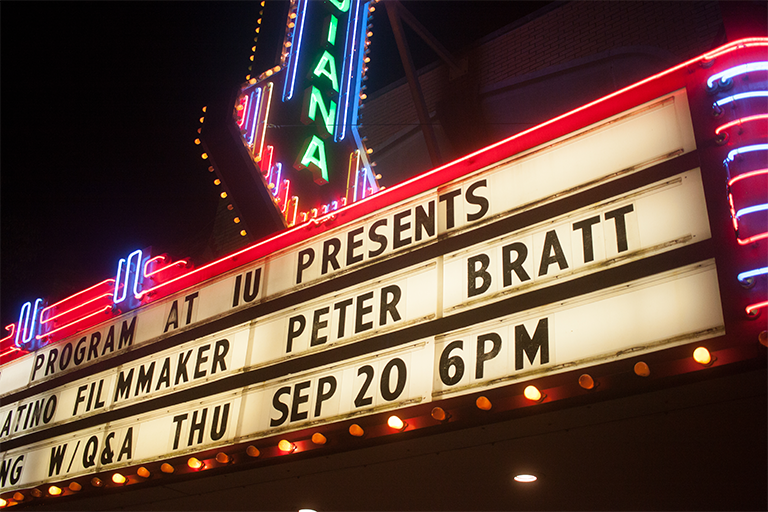 Bratt’s visit was the keynote event of Indiana University Bloomington’s ongoing celebration of National Hispanic Heritage Month. With a range of events supported by the Office of the Vice President for Diversity, Equity, and Multicultural Affairs (OVPDEMA), La Casa (an OVPDEMA-supported center), and more, the university’s celebration of National Hispanic Heritage Month provides individuals on all of IU’s campuses the opportunity to learn more about Hispanic and Latino culture. The screening of La Mission, which was sponsored by OVPDEMA, the Office of the Vice Provost for Diversity and Inclusion, La Casa, and the Latino Studies Program, offered the community an opportunity to examine the role art and storytelling plays in these topics. This spirit of cross-cultural learning was on full display throughout Bratt’s Q&A, in which the discussion ranged from topics including lowrider culture in the Mission to Latino masculinity and climate change. Throughout, Bratt emphasized the importance of storytelling as a way to broaden conversations around diversity and inclusion - a topic of national importance, he said, given current political discussions. In closing, Bratt also provided prospective filmmakers in the crowd with advice on getting started in the film industry. In doing so, he emphasized the centrality of storytelling to any endeavor in life, whether it is building community, practicing social justice, or pursuing art. “I really believe stories, they’re a matter of life and death. They really are,” Bratt said.